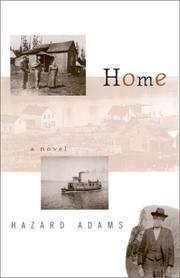 The last in Adams's Academic Trilogy is a thoughtful but soporific work that intersperses a tale of 1990s academic infighting with the history of an anarchists' colony in Puget Sound at the turn of the last century. The author tries to remap the turmoil of Home’s ’60s-based predecessor (Many Pretty Toys, 1999) using the vastly different topography of culture studies and sexual harassment. Some of the same characters as before, now ready to retire, use their accumulated wisdom and cooler heads to soothe discord among the English faculty at State University who are trying contentiously to fill an endowed chair as well as select a new department head. The battle lines are drawn, however. While dean Helen Grant can maneuver to some good effect behind the scenes, and history professor Edward Williams, heading an outside committee to conduct a departmental review, can use his research into the collapse of the anarchist community of Home to guide his understanding of departmental dynamics, neither one of them can defuse a situation that goes swiftly from farcical to fatal. As in the previous installment, sweet reason falls short, but here the level of academic insularity also deadens the drama.